cause serious injury, death, or property damage. For special controlled door height settings. Upper override switch that disconnects power to door if upper limit fails or if limits are overridden. 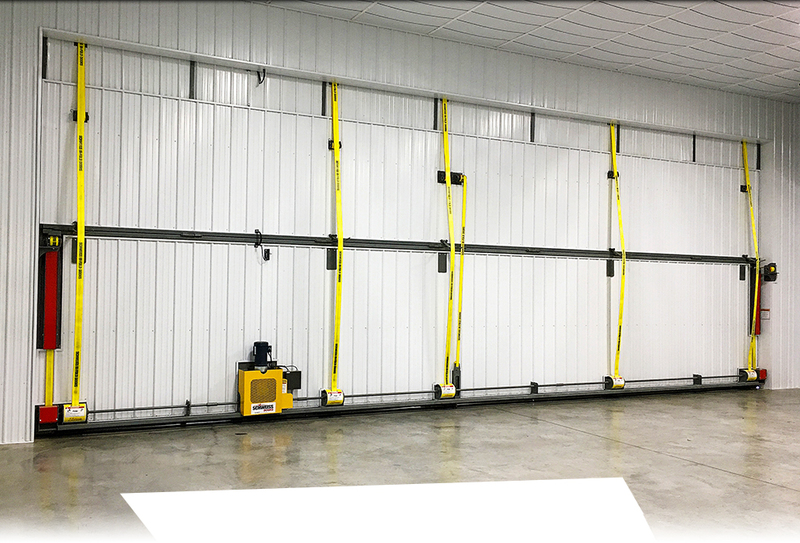 This safety feature is designed to prevent the door from traveling beyond its recommended clear opening height. 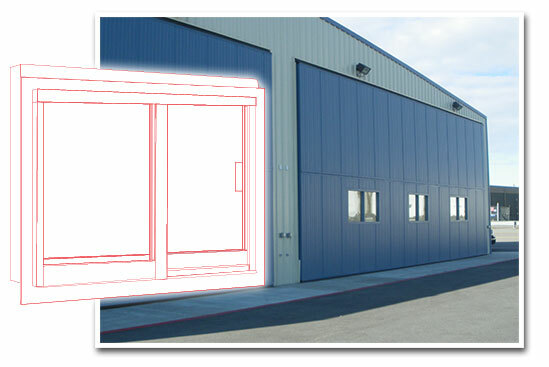 If the door passes its full clear opening height, it will activate the override and stop the door automatically. 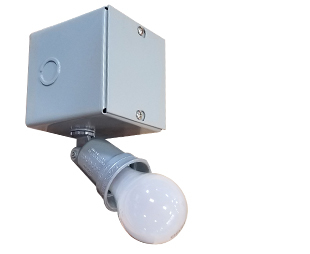 Stops door operation when an obstruction breaks the light beam. 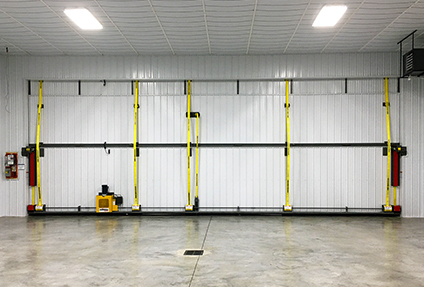 Electric photo eye sensors are mounted near floor level used to prevent or stop the door from closing when an obstruction breaks the detection beam. ALL doors installed on residential garages must be equipped with an electric photo eye! 3-button constant contact dad man switch, which prevents operator from leaving control panel while door is in motion, either up or down. With this type of switch the door will not move in either direction unless the operator is pressing either the "Up" or "Down" button. 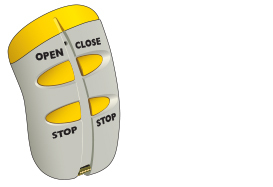 When the operator takes this hand off the up /down button, it will stop the opening or closing of the door in any midpoint position. The motor will automatically stop when the door reaches either the full open or closed position. Stops and reverses door travel upon contact. Electrical sensing switch along bottom of door to stop door if it comes in contact with an obstruction, door will then reverse to a fully open position. Safety edge must be capable of protecting the entire width of the door opening. Alerts persons in the area during door operation. This feature is designed to alert persons in the area of the door that the door is operating. When the door operator activates the door, a warning light rotates and a horn sounds. This feature is especially recommended for doors that will be equipped with radio controls or other remote features. Lights up the doorway when entering the building. Example: On the inside of the door frame, the light will provide extra lighting directly under the door when door is in the wide open position. Custom feature that gives you more lighting. 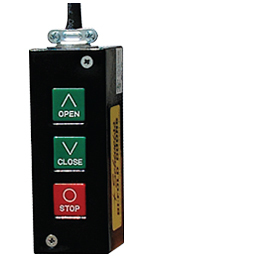 Lets you open/stop/close your hydraulic door from any vehicle. Two hand held remote controls and antennas are included with each door. Customers really enjoy this feature! Warning: All doors equipped with remote operators should have a warning system to alert persons in the immediate area that the door is moving. 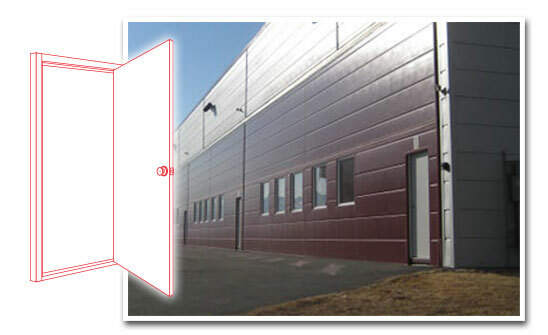 Door is capable of being manually operated in the event of a power outage. 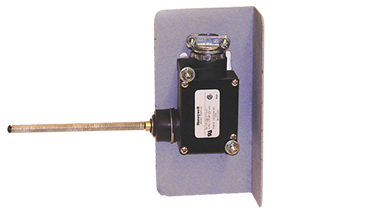 Included is a disconnect device to prevent motor from operating when manually operating door. Schweiss Doors is introducing a unique weather seal kit that can be retrofited to all styles of doors, being Hydraulic Doors or Bifold Doors. The new bottom seal has a special foam cushion that provides an extra weather tight seal on the bottom of any style door. The special designed foam cushion kit allows the door bottom rubber to comform to dips and bumps in the surface giving you a uniform seal to eusure a weather tight seal at the bottom of each door. 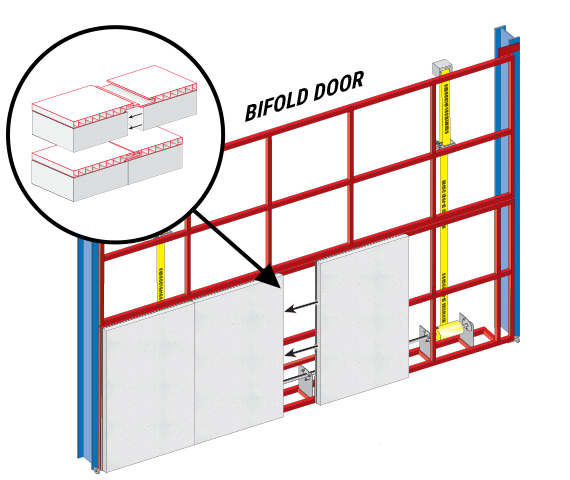 We build the walk door framework into the Bifold or Hydraulic Door. 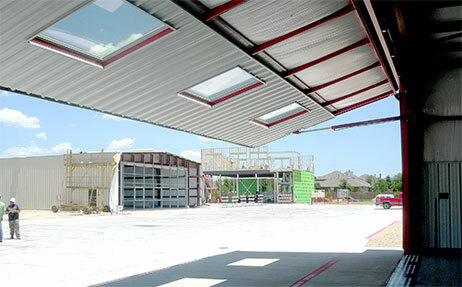 We use factory aluminum or steel walk doors of your choice. All walk doors have a keyed cylinder lock. Also available is keying multiple doors with a master key. We offer a 16" x 16" window within the walk door. Also we can paint the walk door to match the building. Sizes are 36" x 48". All windows have screens and slide open. Windows may be placed at any height or location. Allows plenty of natural light into your building. • Windows - Any size, quantity and placement your choice. Many choices to pick from by contractor or customer. We furnish a 12" rubber boot that seals the bottom of your hydraulic door. The heavy 2-ply, cloth-inserted rubber seal provides excellent weather proofing. Note: Existing bituminous surface / concrete varies and seals should be placed accordingly. 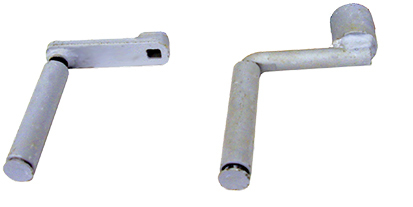 This same continuous rubber seal can be used at the top of door hinges to prevent flow of moisture into the door or building. 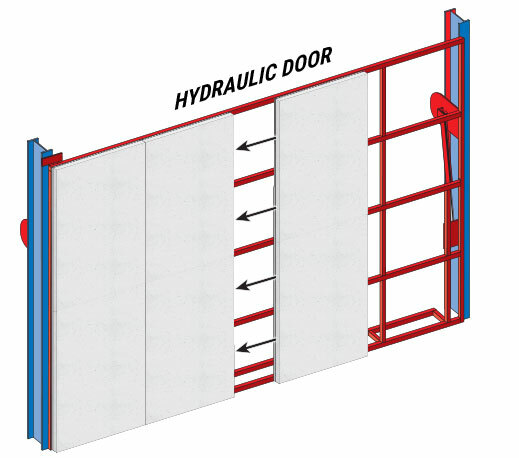 Bifold and Hydraulic Door are made very weather tight. The sides of each door are sealed off with a special weather stripping. The entire door perimeter can be made weather tight. • Keeps heat out during the summer, and inside during the winter. • 100% moisture resistant. If your door does not have a proper vapor barrier, when moisture penetrates the door it will then get trapped in the insulation and become wet and rotten. The wet insulation leads to mold and mildew. • CIF-ULCS 102.0 - Class A Fire-Rating. The interior liner is a protective covering for the insulation. • Will not corrode and guards against water exposure and condensation. • Maintenance free, smooth clean white surface. Bright appearance. DOOR WITH THE "NEW INSULATION"